We have a new line of sweet, minuscule floral prints: Petite Fleurs from the Sevenberry collection. Printed on smooth 100% cotton with a lawn-like drape, these easy-to-wear florals are perfect for shirts, blouses, skirts, or dresses. You'll find them shelved with our vintage and historic print fabrics. Our Big Summer SALE starts today! 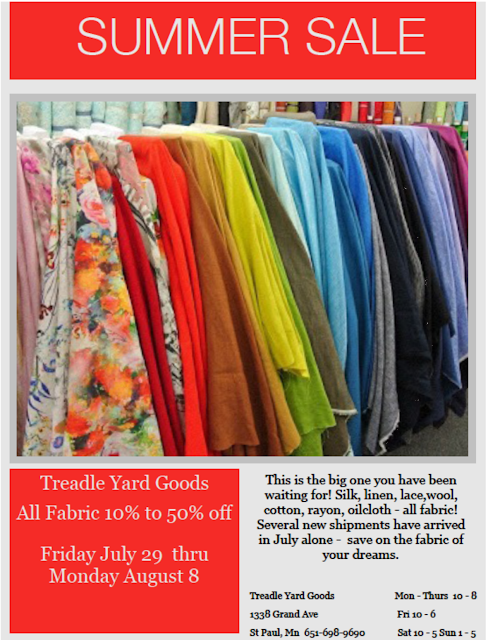 Stop by today for great discounts on EVERY fabric in the store! We're having a Big, Big SALE! Stop by and save! Great discounts on EVERY fabric in the store! We have a charming new group of cotton prints, Meet the Royal Court, filled with Kings and Queens, Princesses, Knights, and castles! We have all of our Royal characters (including the royal pet!) in portraits. And in a large all-over print! There is a print of shields and coats of arms filled with intricate details. And a map print so you can find your way around the kingdom! Best of all, the group contains a project panel so you can make your own soft book! Kids and kids at heart will enjoy this adorable story. Numbered pages and complete directions make this project simple to sew! Treadlette Jennifer saw this cotton crochet-type lace and knew it had to be a cool summer blouse. With lace so popular right now and sheer tops so breezy and comfortable, we have to agree! Jennifer used a strip of the lace's selvage to bind the neckline, and layered the blouse over a silky tank top - no lining needed! The pattern is Vogue 8913, made without the waist seam. Simply overlap and tape your pattern pieces together to cut the top in one piece. What's your latest summer sewing project? 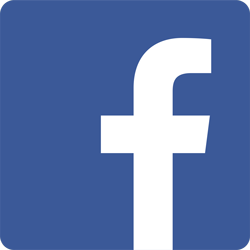 You can always chat and share photos at our Facebook page! We have a creepy cool new group of Alexander Henry's Ghastlies, including a cut-and-sew doll project! Treadlette Nina whipped these up for us to enjoy. The dolls are big, plush, and full of sinister glamour! I am loving these two crabbyface ladies. I don't think I'll offer to babysit. . . Here's the whole group in all their Ghastlie glory. The group comes with an array of fabulous prints! Take a look. A few weeks ago we shared some of our great selection of bright, summery lace. Now we have some fabulous garment inspiration for what you can sew with all that great lace from the pages of Vogue Patterns Magazine. Patterns, clockwise from upper left, are: Vogue 4136, Vogue 8938, Vogue 9109, and Vogue 8808. You can see larger images in real living color if you stop by our store! Or take a look at the online preview here. Even better, we have several of the exact lace fabrics pictured in the magazine! Planning the perfect garment is easy. This cute blouse was made by Treadlette Julia from the Colette Aster pattern. Perfect for hot summer days when you still want to look fresh and sweet! Julia made the short-sleeved version for summer, but Aster also includes a long-sleeved view. Both views feature a V-neck and button front, plus side bust darts for a fit that's relaxed but still neat. You can get this pattern at our store, or find another blouse pattern that's perfect for you! We have a new class coming up at Treadle: Boyfriend Shirt with our new guest teacher Kathleen Richert. Make something special for your favorite guy (boyfriend, husband, son, brother - you pick) in this fun new class! Take your shirt making skills to the next level and explore the fun you can have with piping, custom pockets, and other delicious details. Kathleen makes award winning custom shirts with one rule: she makes all the design decisions. Be prepared to dump your ideas of boring button down shirts; these are one of a kind and amazing! To sign up for this class, give us a call at (651) 698-9690, or just stop by the store. You can see our full class schedule at www.treadleyardgoods.com/classes. Hot summer weather calls for crisp, cool fabrics, and natural, breathable linen is perfect. We have a great selection right now. Here are a few of the latest highlights! Linen doesn't have to mean undyed neutrals. Take a look at these super bright linens to make a color statement! This piece is all about the texture with its large, coarse weave. We have this fabric in several colors! You can go all-natural AND high shine with this linen metallic print! And it's not all solids, either. Check out this watercolor floral print. This washed linen has an incredibly soft and buttery texture. So enjoyable to sew, and so comfortable to wear! We have this is several colors also. Stop in and whip up some quick, cool summer garments! 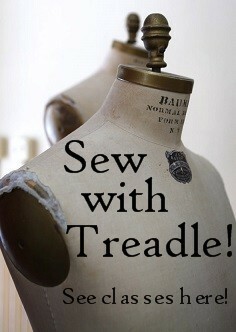 Treadle will be closed on Monday, July 4th. Enjoy the holiday! Shop regular hours the rest of the weekend: 10-5 Saturday and 1-5 Sunday.